This buddy is now in my deviations in deviantART, CLICK HERE. I just posted this in deviantART and already three people added it to their favorites and one commented, wooooh. 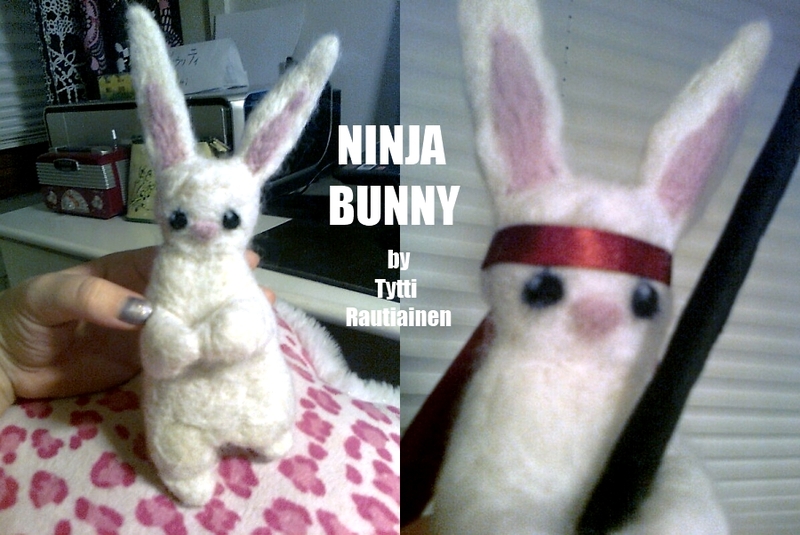 This was a Christmas present for my dear friend Raine, it is actually him because he is just like a rabbit but also a ninja! I needle felted this cutie and also made him a looong red bandana and embroidered 42 with numbers and kanji and glued some green sequins to the ends of the bandana. 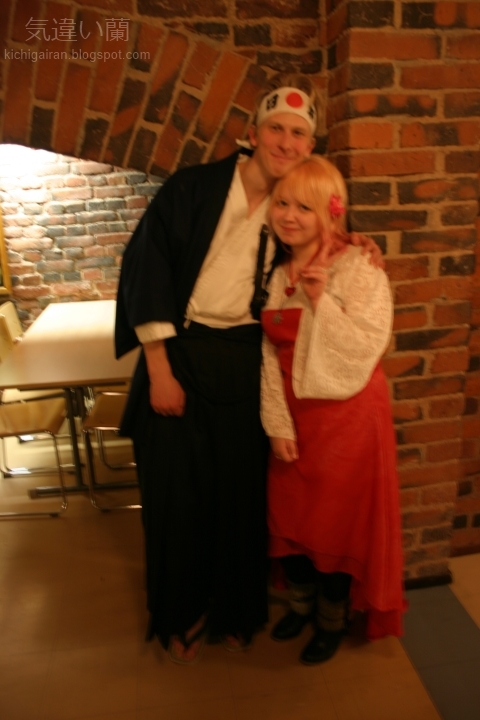 That's my friend Raine and me at his farewell party in March, time flies so fast! So many, many things have happened, like the fact that I have already performed three times in that outfit... woah. Maybe soon I get to sing my song for the fourth time? Oh this reminds me, I have a video of my performance at my school party or whatever it's called. 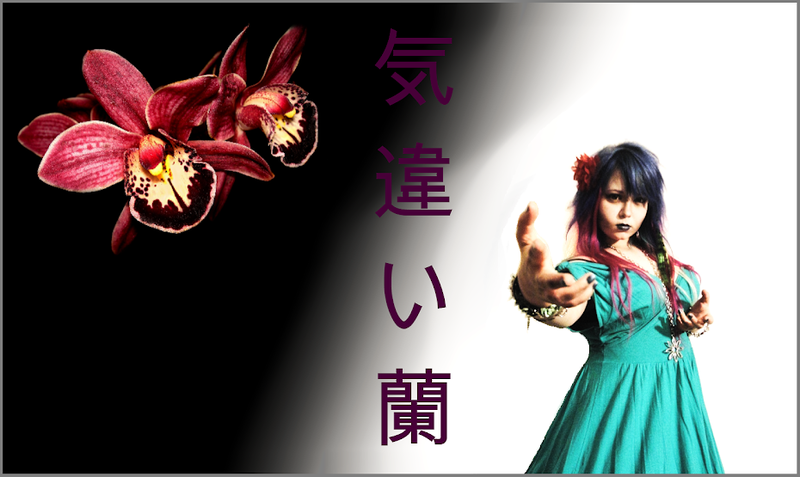 :D I should put in Youtube after editing it just a bit. Everytime I sing high it sounds horrible because of the video. But I hope I can get the audio track edited so it's somewhat okay to hear :D So look forward to that, coming up quite soon! And since there was one bunny in this post, why not introduce another hopping friend! I call him THE DEMON LOCK BUNNY. I realized later that in a way she is like me. Loony monster. Hahaa, so I guess we're both bunnies with Raine XD You can find her in deviantART as well. 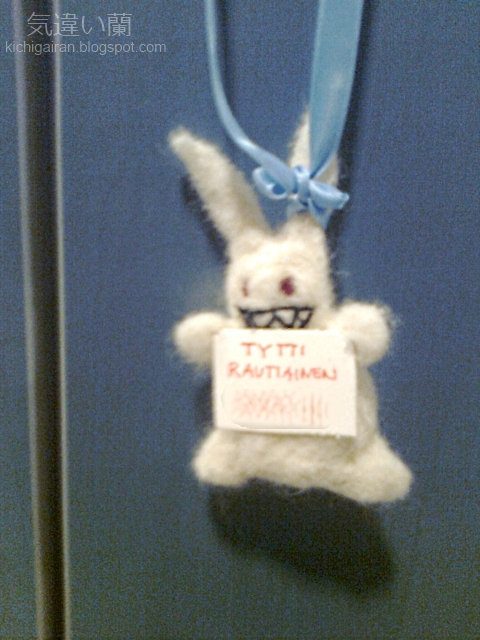 This buddy is actually attached to a lock in my school locker. She is a protector of my locker! She was needle felted too but quite quickly, this was my first school assignment last August I think. So cute rabbit!! :D It really looks like Raine! :) You're so talented!